Clem is a boy in strife. he’s now in a school for toxic teenagers. wants him to write letters. who finds an unexpected future. You can find the Book Launch Poster here (1.5Mb PDF file). A compelling story that offers an insightful look into the life of a troubled teen who ultimately finds freedom. Clem’s life speaks for many young people who are often branded as a teenage 'stuff-up'. Through the personal letters from Clem, Kim Miller powerfully portrays how the inner workings of past experiences, relationships and trauma create the person we are and how healing can come through discovering truth, justice and love. This is a must read. You’ll be taken on a powerful journey of what it means to come face to face with the truth. Terry O'Connell is the Australian Director of Real Justice and is the man behind Australia's young offender restorative conferencing. For his foundational work with young offenders Terry was awarded The Order of Australia Medal. Parker Palmer, in his brilliant little book 'Let Your Life Speak', bemoans the fact that many/most of us live lives 'other than one's own'. We allow what happens to us - especially the wounds inflicted deliberately or unintentionally by others or by circumstance - to rob us of our true/free self. As a result, no punishment anyone might inflict on us can be worse than what we inflict upon ourselves: we thus 'conspire in our own diminishment'. Kim Miller's latest book, 'They Told Me I Had to Write This' (Ford Street Publishing, 2009) is a brilliant narrative-commentary on Parker Palmer's wisdom, written as a teenage boy's conversations with himself via letters to his grandmother - about school, friends, fights, teenage romance, sexual abuse, relating uncomfortably to a single-parent father (whose wife, the boy's mother, died as she was giving birth to him: that's a key to just-about-everything-else...). And how does one deal with all these painful loose ends? Kim Miller's wise suggestion: through the help of skilled and caring significant others who help us face our demons, do a thorough job of 'reality-checking', and facilitate reconciliation with the important people in our lives. This is a book I planned to skim, but I got hooked, and read every word. It's a terrific read. But for whom? I'd give it to intelligent teenagers and their parents/teachers - indeed anyone who wants a glimpse into the lives and vocabularies of contemporary adolescents. There's a couple of counselling verbatims between teenagers and a school teacher that are worth the price of the whole book. Thanks Kim! 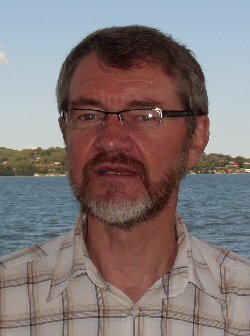 Rowland Croucher is an Australian academic, teacher, pastor, broadcaster, editor, executive of World Vision, author, omnicompetent, knows about books. They Told Me I Had To Write This by Kim Miller. Clem is a teenager with a troubled past, sent to a school for toxic kids because the normal school can’t handle him. There he meets Rev, the school counsellor, who suggests he write letters to help him deal with his problems. He doesn’t see the point but knows he has little choice. Through his sessions with Rev and his letters to his grandmother, Clem faces a traumatic past and an unloving father who he believes blames him for the death of his mother. Told in letters from Clem, this is an honest, not-easy-at-times portrait of a troubled teenager, who, with the effort of dedicated teachers, his letter-writing and a first girlfriend, begins to find his place in the world and realise that his future may be worth sticking around for after all. is Flinders University’s 2008 May Gibbs Fellow. Clem’s a bit of a no-hoper. His mum died when he was born, his dad has no time for him, he’s been in trouble at school, and even with the police. He has other, darker secrets as well. This term he’s not at his old school any more—now he’s at Rocky Valley. It’s a bit different to his old school—they have their own livestock, and they go camping, and abseiling, and have their own mountain biking track, which bike-mad Clem loves. They also have Session—every student spends time one-on-one with a teacher. Clem’s teacher is the Rev, who owns a classic car, an even cooler motorcycle, and has a habit of asking hard questions. Now he wants Clem to write letters. As if that could help. As if that could change anything. Clem is a powerful character with a strong voice, whose growth and changes through the story never fail to feel authentic. His experiences and story have a real resonance, no doubt from author Kim Miller’s years of working with just such kids. Dealing with violence, drugs and sexual abuse, They Told Me I Had to Write This is recommended for more mature readers. 'Bookseller + Publisher', July/August 2009 edition. The review above from Heath Graham is on page 48. 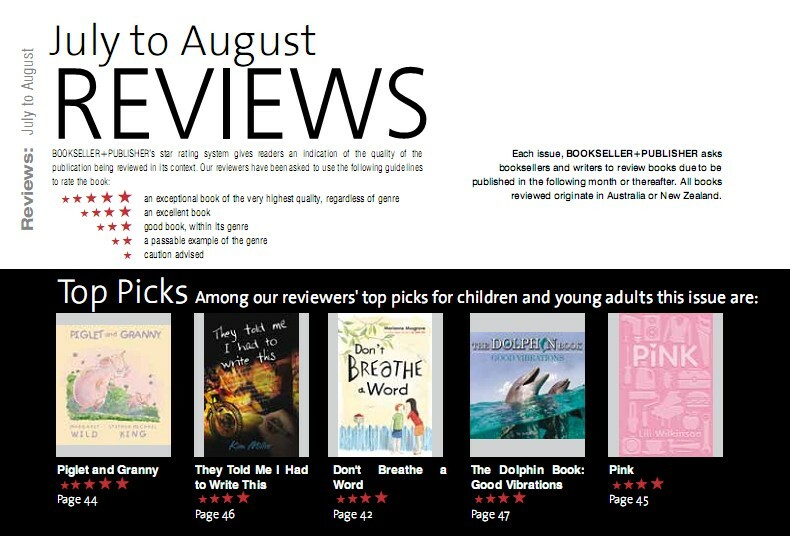 You will be able to access the July/August edition of Bookseller + Publisher for July/August only. Click at the top right on the image - Inside the Current Issue - and the viewer will open. Don't click on the book, click the page turning controls at the bottom of the screen. Page 34, and the image above, is Page 52 on that control. 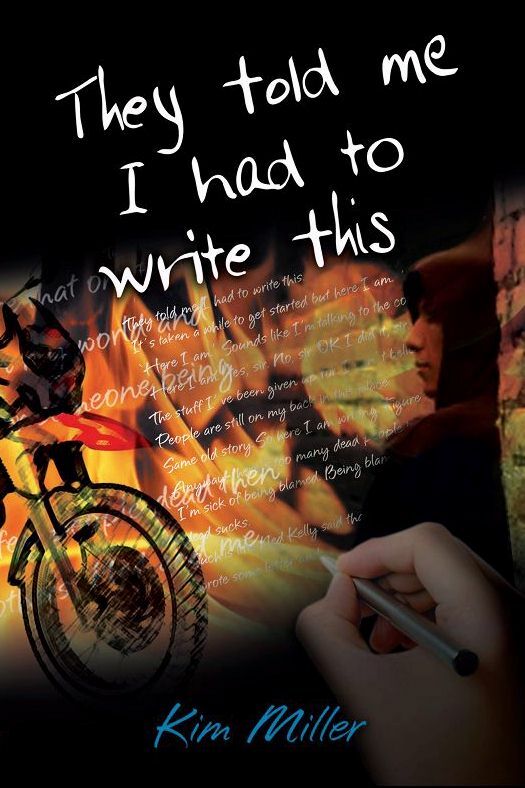 ‘They Told Me I Had to Write This’ is about more than Revs and bikes and racing. But that fast riding bike theme will initially attract a youthful readership. The sustained viewpoint of Clem, who is at the school for toxic teenagers, is credible. These are the kids who are too hot to handle. Gran and his Mum are dead, and initially we’re not sure why. He’s told to write regularly to his dead Gran as a way of coming to terms with what’s happened. So he does, candidly. Clem astutely evaluates teachers, counsellors and the other boys, while still trying to find his own answers. He’s no fool, just a damaged teen. in difficult circumstances, some of which were not his fault. The author doesn’t shy away from serious issues, such as drugs, bullies, death and police implications, but it’s well paced, with in-between humour, which will appeal to the age group of 13 upwards. Underneath, there’s a yearning for family and a rough compassion for other boys who are doing it tough. The girlfriend Ultra Violet and her family provide hope, and delicate under-writing about a ‘first love’ from a romantic Clem. The cover works, combining the bike wheel and the handwriting. The graphic of the occasional hand written page from Clem’s perspective, within the chapters gives extra insight. His DVD reviews in different fonts, are his attempts to make books they read in this school relevant to his life. Teachers, parents and educators are always worried about YA books that deal with ‘edgy’ subjects. But the reason I’d recommend this book, is the strength of the Clem character, despite his vulnerability. It’s realistic, but hopeful. I have to declare ‘insider knowledge’. In 2007, I was invited to Condobolin in outback NSW, to run workshops for a community struggling with drought. Locals wanted to have a literary festival to attract business and energy to the town. Ex-Condobolin-ite Kim Miller came back to town that weekend, with the beginnings of this ‘Clem’ manuscript, which was workshopped during the festival. ‘They Told Me I Had to Write This’ is the result, which made that rural initiative very worthwhile, even if my mobile didn’t work in the remote Shire of Bland in which Condobolin is situated. This book is not bland. Hazel Edwards is one of Australia's most well known Children's and Young Adult authors. Her first book, 'There's A Hippopotamus On The Roof Eating Cake', this year celebrates it's thirtieth birthday and is still in print. Clem has problems – big problems. He is nursing the hurt of a lifetime: his mother’s death, which he feels responsible for, his father’s indifference towards him and a horrible secret that threatens to tear him apart. After years of troubled behaviour he lands himself in Rock Valley, a school for problem teens where he meets The Rev, a Falcon driving, motorbike thrashing counsellor. Encouraged to start writing as part of his therapy, Clem documents in a series of letters to his dead grandmother life at Rock Valley, and most importantly, all the emotions he’s bottled up for so long. Bit by bit Clem reveals to the reader – and himself – the cause of all his angst and is finally able to begin the healing process. They Told Me I Had To Write This is reminiscent of many of John Marsden’s novels – Letters From the Inside, So Much To Tell You and Dear Miffy spring to mind -- with one major difference: Miller has managed to infuse his narrative with a greater sense of hope and, on the character’s part, accomplishment than Marsden did. At the end of Clem’s story (which, of course, for him, is just the beginning), I wasn’t dogged by the dark cloud Marsden’s stories seemed to leave me under. Perhaps this is just me, but I feel it worth noting. Miller’s voice is fresh and his characters authentic. This glimpse into Clem’s world is both informative and entertaining; readers will feel his emotional turmoil, and for those who’ll no doubt identify with much of what Clem is going through, Miller offers genuine solutions to these conflicts. Holding a PhD in Psychology, Miller’s insights are well informed. They Told Me I had To Write This deserves a place on every library shelf. Endorsed by such heavyweights as: Rowland Croucher, World Vision executive, author, editor and broadcaster (among other things), and Director of Real Justice, Terry O’Connell, whose work with young offenders earned him The Order of Australia Medal, this is far more than just a story. Jenny Mounfield is an Australian Young Adult author who knows that you don't mess with the ice-cream man. Clem is a teenage boy with something hidden in his past… something he can’t bring himself to talk about; something he doesn’t even want to think about; something that is holding him back from living his life; something that affects the way he behaves and the way in which he relates to people. In order to face the future and ultimately find freedom, Clem will need to confront his past and bring his secret out into the open. This is a confronting YA novel about a boy who’s in trouble. His mother died during childbirth, his grandmother (who he sees as the only person who really cared for him) has recently died, he doesn’t get along with his father, he’s been sent to a special school for troubled boys… and this past looms over him like a dark storm cloud. From this description it may all seem like doom and gloom, but it isn’t. This novel is actually about Clem slowing coming around to face his problems and his past. So, although at times a dark novel, it is also one of hope and a potentially bright future. Through a series of letters from Clem to his deceased grandmother, author Kim Miller manages to create a sympathetic and likeable character. Most importantly, he creates a very believable transition as Clem develops and changes his views of his life and the world. The format of letters from Clem to his grandmother is also a clever way of presenting a confronting story without getting too shocking in terms of description and language. It’s believable that a kid like this would tone things down a little in letters like this and not swear to his grandmother. It’s a good way of keeping the character believable, while ensuring the book will be palatable to parents. They Told Me I Had To Write This is a good, engrossing read. Highly recommended! George Ivanoff is an Australian Children's and Young Adult author. What an emotional roller coaster ride for Clem, and all who read this absorbing and challenging book. Kim Miller's knowledge and understanding of angry and unhappy youths comes through very strongly as he writes with emotion and candour through an adolescent's voice. The title implies an unhappy youth, yet throughout the novel hope shines through. Clem believes his mother's death at his birth is his fault. He and his father have a tumultuous relationship made more difficult from a sexually abusive teacher! He writes to his recently dead grandmother at the behest of the school counsellor called 'the Rev'. The language is that of a teenager at war with himself and the world, (he's in a school for toxic teenagers), but wonderful pieces of wit and humour and growing self awareness are laced throughout the letters and gives the reader a real sense of hope for the 'Clems' of this world. Clem finds peace within himself, a first love and a strong bond between father and son. The topics are tough and of our time but the enduring strength given by the teachers in Clem's school is a reminder of the positive effect teachers can have on each child's development. A fast paced novel well worth reading no matter who you teach. Sue Nosworthy is a teacher with a view to the book's place in an educational setting. The review is in ReadPlus, a resource for teachers, librarians and parents. When I asked Sue for permission to post the review here I got the following email, which I gladly add to her review. That's fine by me. It is a novel every teacher should read for it's far too easy to slip into a way of responding to students and forget how sensitive and complicated our students are. I'm hopeful (and know of some) teachers who respond as your "Rev" did. I found it a very soul searching book. I'm glad to have had the privilege to read it. No one told me I had to write this – except deep down inside myself. Because it’s not often you find a book that grabs your heart, wrings it out – then refreshes it with hope. And all this through a bunch of colloquial letters. Kim Miller has a heart for troubled teens and this is clearly evident in ‘They told me I had to write this’. He speaks the language (which I didn’t always ‘get’ straight away!) and tells some awful truths – but he gets you inside the head of a wild child – and once you’re in Clem’s head, he soon digs into your heart. I had not expected to find Clem so lovable. Oh, he was very real. And far from perfect. But he was lovable! 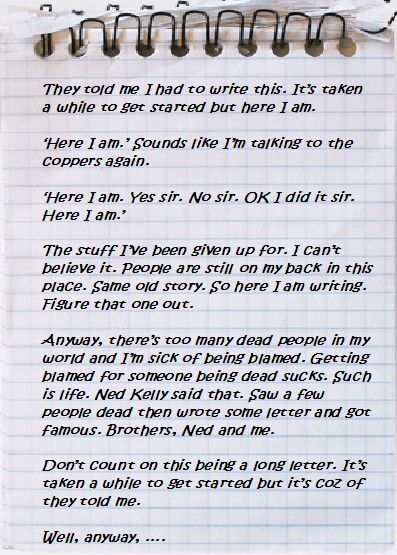 ‘They told me I had to write this’ is an incredible story that will have repercussions wherever it is read. I just hope it's read widely! Kathryn Apel is an Australian children's author who has recently published a wonderfully playful children's verse book, This Is The Mud. They told me I had to write this. It’s taken a while to get started but here I am. ‘Here I am.’ Sounds like I’m talking to the coppers again. The stuff I’ve been given up for. I can’t believe it. People are still on my back in this place. Same old story. So here I am writing. Figure that one out. Clem is always in trouble – with his teachers, with the police, with his dad. In fact, he’s been in so much strife that now he’s been sent to a school for troubled teens. His counsellor, the Rev, wants him to write letters, so he writes them to his much loved but now dead Gram, telling her about his day to day life – and about his past. As he settles into life at this new school, Clem enjoys bike racing, makes some new friends and unexpectedly finds a girlfriend. But he also has to face some hard times – the death of one of his classmates, his troubled relationship with his dad, and some tough memories from his childhood. Can he get through all these and turn his life around? They Told Me I Had To Write This is a gut-wrenching novel, which is likely to reduce the reader to tears in places. At the same time, though, it is an uplifting read. Clem is a likeable narrator – honest, self-deprecating and humorous – and it is an honour to witness his growth as he turns his life around with the support of good friends and caring adults. There is a touch of romance, lots of bikes and vehicles, and some twists, and the use of the letter/diary format makes the text both accessible and interesting as we wait for Clem to divulge information. Sally Murphy is an Australian children's author. Her reccent book Pearl Verses the World won the Children's Book Category in the Australian Independent Booksellers Awards. I was guest blogger over at Boomerang Books Blog. Boomerang Books is an online bookstore. The request from the editor was that I write something about the influence of my life and my work on my writing. Being a prison chaplain means I work among men with some pretty severe stories. But I don't write about the people I work among. I write stories that come from my own head. I suppose that means I write about me, just like any other author does. You can chase up the blog here. This novel is about healing. It is a series of letters from Clem to his grandma. The letter writing was the idea of Clem’s counselor, ‘the Rev’ who thought that by writing to his dead grandmother he might allow himself to open up. Clem is at a school for delinquent, damaged children. He has a number of pyschological problems, the first being the death of his mother as she gave birth to him, and the second a darker episode of abuse from a teacher. Through his relationship with his first girlfriend, through the accidental death of on of his school friends, and finally through the support that the Rev gives him, Clem is able to write to his grandmother about all the secrets that trouble him. I imagine that if a young reader who does have secrets comes to read this book, he or she might be willing to trust them at least to paper. And this would be it own healing experience. Children’s vulnerability is at the heart of this book, a vulnerability that makes it possible for them to grow and possible for others to destroy them. They Told Me I Had To Write This is the story of Clem, a troubled teen who has reached a watershed in his life, the point at which he must terrible experiences in his past and start to rebuild a relationship with his father. Clem is an island, separated from family and society in general by his emotional wounds and behavioural problems. He attends a boys-only school for youths whose needs are not met by mainstream schooling. The school works as much on life-skills and counselling the students as it does on teaching education fundementals. Each young man has a range of issues to live with, and the teachers carefully guide them through this often violent self-expression to seeking a personal truth. The book is written using a first person letter/diary format, and the colloquial style is effective in drawing the reader into the confidence of the narrator. Clem’s confessions and gradual self-realisation are raw with emotion and power, while full of self-deprecating humour. Clem writes to his grandmother to fulfill one of the requirements set by the teachers and chooses her, as one of the few constants in life, as his confidant. As the reader learns more of Clem’s past, they also learn that his Gran has died. For Clem she represents the first step in a path of discovering forgiveness and self-love. Despite the subject matter including violence and sexual assault, there is a fairy-tale styling to Clem’s life as events come together: a steady girlfriend complete with understanding in-laws, a repentant father and a cathartic resolution of a sexual assault experience. There is a sense that ‘everything has worked out now’ that, in less skilfull hands, could have become a saccharine tv-drama resolution instead. Clem’s simple honesty, and journey of self-discovery is moving and full of heart. The character development is realistically paced, and Clem works hard to heal himself and understand past actions. The book has a strong male focus and authentic, believable characters. It deals with male aggression in a frank and postive light. [The reviewer then contrasts the ending of this book with another he has reviewed in the same journal. The following sentences remove the comparison and adjust the text to suit. My italics.] Clem’s story is a neat package. Highly recommended. Viewpoint: On Books for Young Adults, is a project of the University of Melbourne. Realistic. Age 13+ An easy to read yet confronting story. They Told Me I Had To Write This deals with some challenging issues including violence, death, drugs and child sexual abuse. The novel it told from the point of view of trouble teenage boy, Clem. While attending ‘a school for kids too hot to handle’ Clem is asked by the school counselor, the Rev, to write a series of letters. This form of therapy enables him to address some deep issues. The letters form the basic structure of the novel. They Told Me I Had To Write This takes the reader on an emotional roller-coaster led by Clem’s clear voice which has an honesty that draws the reader into the story. With slang and an angry attitude, Clem recounts how he is responsible for his mother’s death and his subsequent estrangement from his father. However, the more he opens up to the Rev, the more his eyes are opened to the truth about himself. The counselling scenes feel authentic and give the reader a glimpse of some of the difficult issues faced by troubled youth. The author’s background is evident in his clever resolution of such challenging issues. The occasional ‘handwritten’ note interspersed within the text creates layers of meaning for the reader, however, the large font is immature and there is little clarity in the layout of the letter entries. 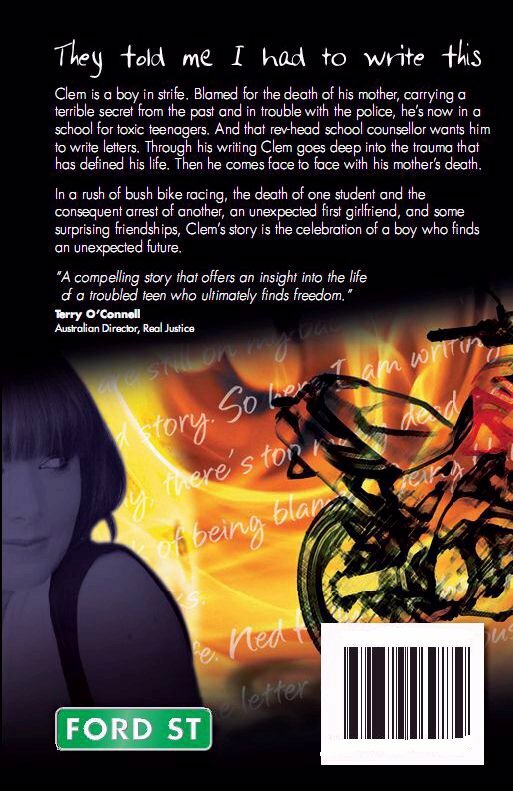 A story of bush bike racing, friendship and surprises, The Told Me I Had To Write This is a winning boy’s read. With a appealing front cover, teenage boys won’t be disappointed by the story inside. The process of writing and editing a book leaves a lot of loose ends. There was a time when all those loose ends went somewhere, but revisions of the story sometimes removes the destination and forgets about the pointers. I'm a bit of a messy person and the story had some mess lying around. Saralinda Turner cleaned up all those loose bits. She saw the whole book as one, recognised the stuff that had to go, and returned my manuscript with pencil notes everywhere. When I had completed the work required by such close editing I loved the difference. It was as if the story was teflon coated. I work among people who generally don't have good education and are not readers. People, both adults and teenagers, who don't normally read books tell me that this book is easy to read. That smoothness is the result of a fine editor. I was born in the motorcycle ward of a local hospital out west, and grew up on the red soil plains of country town Australia. Out there the essentials of life were a bike and a rope swung out over the river. School was not a good experience for me. I was the kid out on the sidelines and was glad when it ended. Study came with great difficulty and I dropped out of university and wandered through many areas of work. I worked in photography, warehousing, I supervised bakery deliveries, managed a Pizza Hut, and spent a long time in hospital after a very bad motorcycle accident. I was more interested in bushwalking, rock climbing, caving, skydiving, dirt bike racing - anything other than study or work. In other words, the usual. 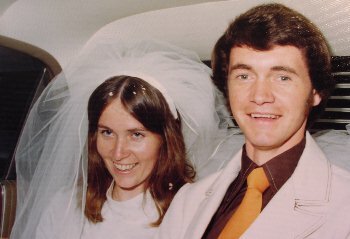 I met and married Kay in 1975 and we have one adult son, Sam. Being married to such a wonderful person is one of the greatest blessings of my life. In my thirties I was ordained a priest in the Anglican church. I started to find academic success and worked up to a PhD from the University of Exeter in the UK. My doctoral work bridges theology and Jungian psychology. Jungian themes sometimes appear in my stories. My writing started in childhood when I would process my life on an old typewriter. In my adult years I wrote short stories for pleasure. The stories tended to mirror those of my youth in that they focussed on people dealing with tough inner issues. One childhood memory about writing comes from when I was about ten. I'd been chosen to write the class entry piece for some competition. Everybody else was outside at sport and I was sitting in there being lonely, just looking out at them. I didn't write a single word. Looking back the important thing is not so much the failure to write anything, but that the teacher saw some talent in me for writing. It was a long time coming to maturity. In 2004 I decided to send some stories to a publisher. He took my work seriously, and so I decided I should too. In February 2006 I was in print with a collection of shorts. The 'inner issue' theme is reflected in the book's title, Insiders. After all, the toughest journey of all is the journey inside the mind. As Insiders came from the printer I found myself writing They Told Me I Had To Write This. It was somewhat unexpected, and a great experience. The first draft of 55,000 words took five days of hyperactive energy while on holiday. The real work took three years of spare time to knock it into shape for publication. Three years after that sudden start the book was on its way to the printer. I'm still a bit dazed by it all. Trying to take my photo is a pretty frustrating thing for most people to take on. Here is my polite look. Or is this 'patience'? I forget. Kim goes driving off with the most beautiful girl in the world. I made my suit myself from heavy white canvas that I bought at a tent shop. That was OK in 1975. So were orange ties and brown shirts! The suit is gone, the marriage survives. I love this life. 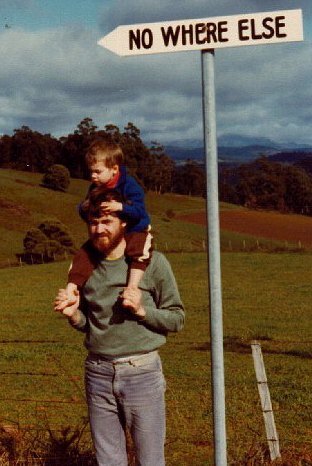 On holiday in Tasmania, 1982. This is just to show that the white whiskers in the top photo are not the whole reality. Little Sam is now about 6 foot seventeen inches tall. I reckon that's unnecessary.